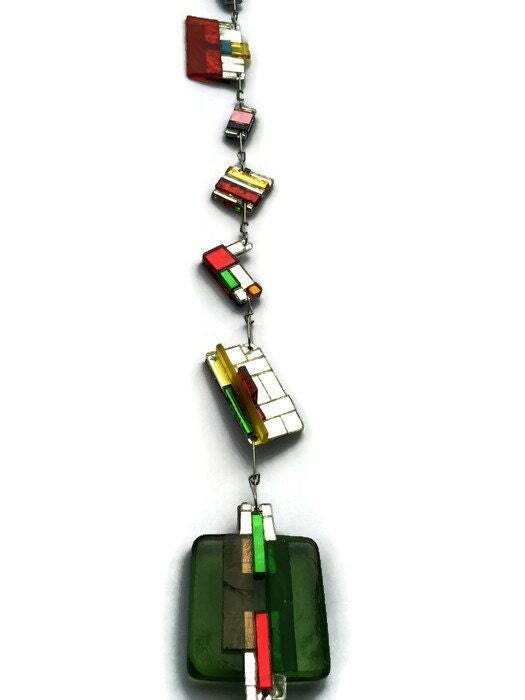 Atomic sparkle and juicy colors all in one gorgeous garden mirror mosaic sun catcher. Stout and flashy, hang it where you'll see it day and night, inside or out. The prime sun catcher equation is: light + movement = maximum sparkle, so make sure it will catch a breeze or a finger push. The perfect gift for gardener, self or magpie. 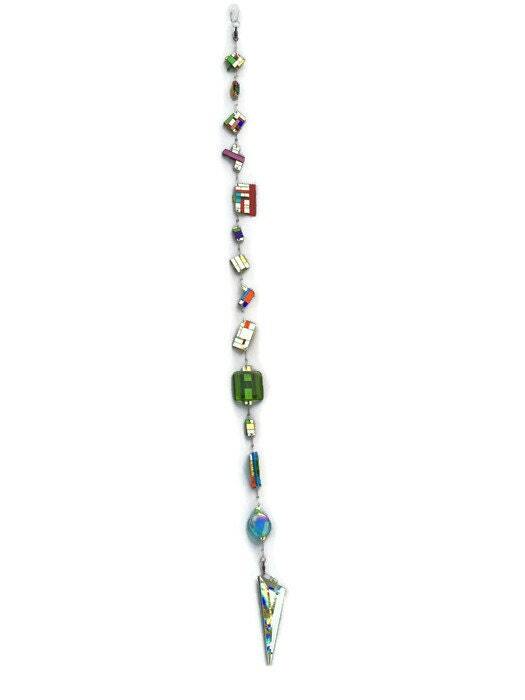 This contemporary atomic sparkle sun catcher is 45" long, from hanging ring to prism point. 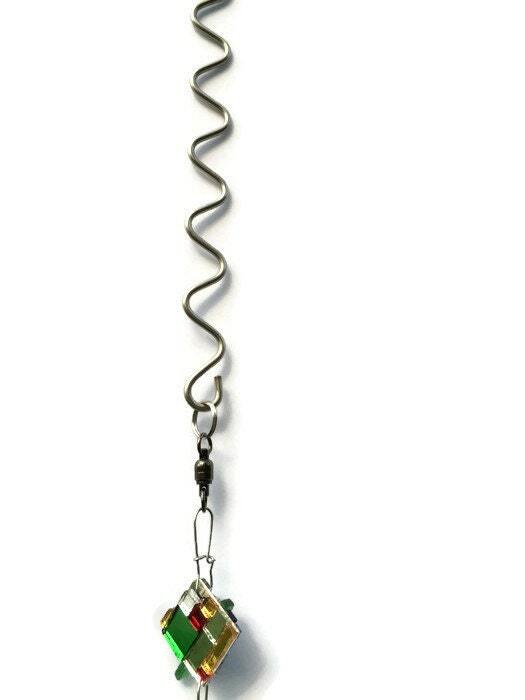 A stainless steel squiggly hook is included in the price and adds another 8" to the sun catcher for a total of 53". 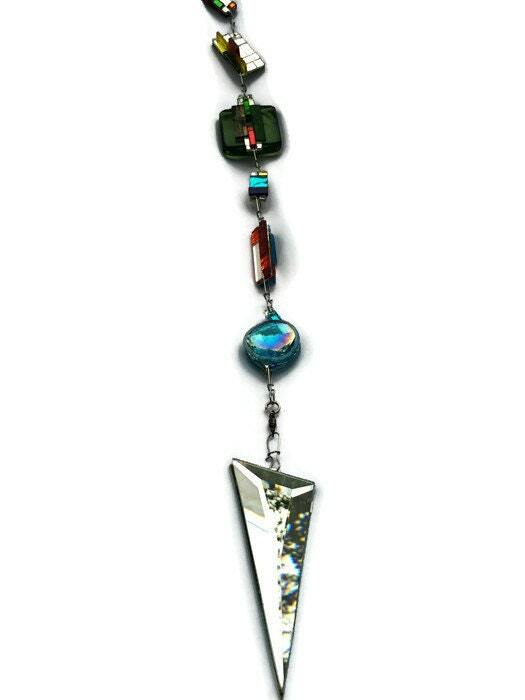 13 individual two-sided mirror and colored glass mosaics are linked together with stainless steel snaps to create the chain, anchored with a beautiful two-sided prism triangle. When light hits the prism just so, rainbows are thrown randomly about, explained only by the laws of physics. You will so dig it. A 60-pound test stainless steel ball bearing swivel moves from the top. A 20-pound test swivel enhances movement of the bottom prism. 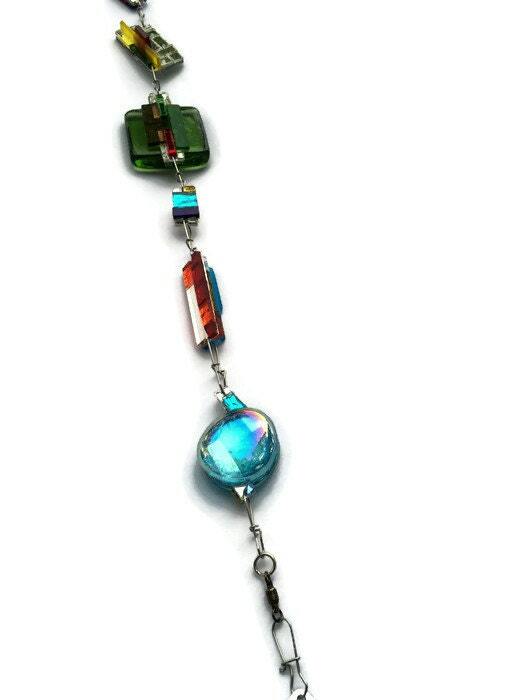 This is an industrial strength sun catcher: no fishing line, monofilament, nor kite line. All connections are stainless steel. Hang it where it won't knock against anything and sparkle, reflections and rainbows will accessorize your home and garden for freakin' ever. Or nearly. Night light: car, lamp, moon make mirrors flash like paparazzi. Be sure to think of night sparkle when hanging. A hand-painted post-consumer Kraft gift bag with stout handles, so you're good for gifting.